Excuse the pun, but I do have further news re the broken bones. I'm going into hospital again tomorrow for some corrective surgery. 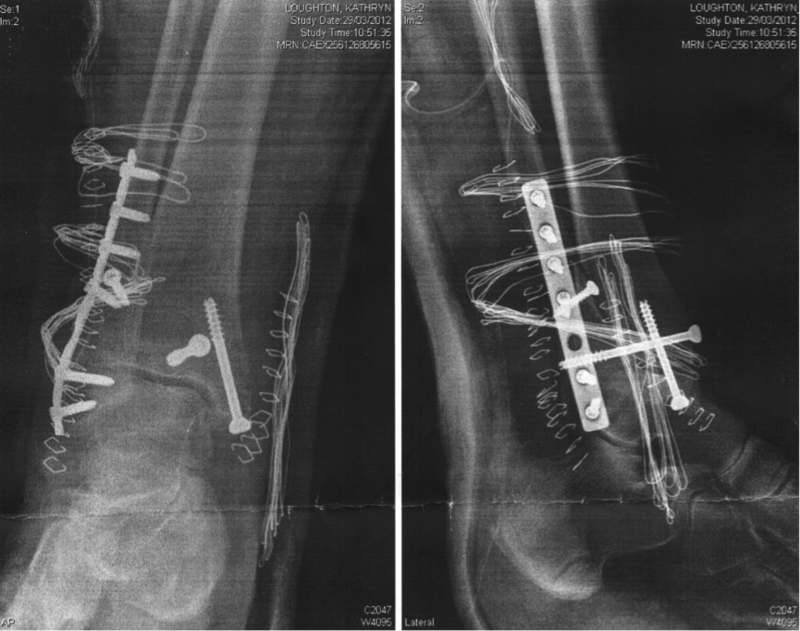 Seems the emergency surgeon in spain didn't quite get it right which will cause problems down the road such as arthritis and the potential for ankle fusion surgery down the track. Some new british hardware will be installed and I'll be back to square one, another 6 weeks on crutches with a mulitcultural right leg. As you can imagine, I'm not really happy about this outcome, but don't have much choice. To add insult to injury, we are now arguing with the insurers. Unti now they have been great, but are refusing to pay for private surgery in the UK and want to send me home and throw me into the public health system. No way, José!! Our dear long suffering friends, Pete and Kath will be stuck with us for some time, and we are stuck with Welsh weather. 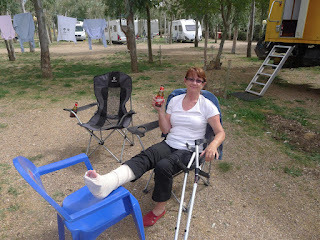 I thought that only 10 year olds were supposed to fall off their bikes and break a leg – not 56 yr olds!!! However, this has now happened to me. We are in a town called Merida in the Extremadura region, famous for its Roman ruins and now for ruined ankles. We were pottering about the town, when my bike slipped on a piece of glossy paper that flew into my path. 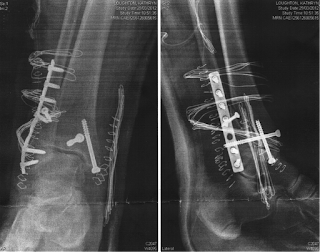 I crashed to the ground and broke my ankle plus tibia and fibula – a trifecta. 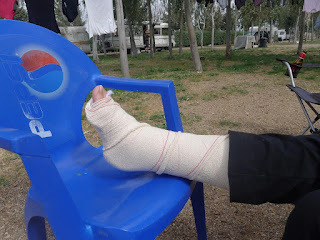 With the help of the local police and ambulance I made it to the emergency room, had the usual x-rays etc and was examined by the resident orthopaedic surgeon - all without pain relief. He was wrenching my poor broken foot around and telling me to relax, when I developed sudden onset Tourrette’s Syndrome. I don’t usually swear at doctors, but this was beyond my level of tolerance, the pain was incredible!!! He got the message. Anyway, they whisked me into surgery under epidural (blessed numbness) and I’m now sporting a plate and 9 screws. My ankle now looks like it belongs on a shelf in Bunnings*. Thankfully I needed only 2 nights in hospital. Whilst it was a modern hospital with modern equipment, it was very Spanish, with nurses who had clearly been to the Hitler Youth School of Nursing, efficient and brusque. They insisted on talking to me loudly in Spanish in the hope that eventually I would understand them. My Spanish is still limited to ordering beer and coffee, not really helpful in this situation. Anyway for future reference I learnt the 2 most important words you need in a Spanish hospital - dolor (pain) and orinar (urinate) ie; I need drugs, and I need to pee (no catheters!!). The noise level in the hospital was incredible, often sounding like there was a cocktail party in full swing right outside my door. I have no idea who all those people were, but man they could talk – and loudly. So now we are holed up in a small cabin at the campground, waiting for me to be able to fly to the UK where I will stay with friends to recuperate. Lawrence will get the Mog there somehow – hopefully by ferry from the Atlantic coast of Spain. I’m crap at using crutches I’ve discovered - I’m terrified of falling over, so need lots of assistance. Gin and crutches don’t mix. The insurance company so far has been great, and all is being taken care of financially. Not sure when the next blog will be – probably from Pete and Kath’s in N.Wales (my baby-sitters). Watch this space for next exciting instalment. 2/4/12 Update: Have left poky cabin and now in lovely Parador, which has enough room to swing a cat, if one so desired.